Hi everyone, Vonnie here from My Catholic Kitchen. My friend Nettie is gone for a few weeks helping a friend after surgery. So, I offered to guest post for her until she gets back. I had a real hard time trying to pick out what I wanted to make. I wanted to make something that made everyone feel welcome and comforting. I decided to go with the Sloppy Joe. Some foods reminds us of nostalgia. 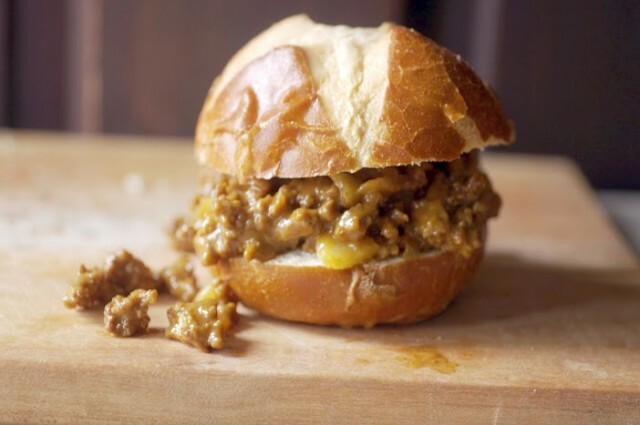 I remember going to school and finding out they were serving Sloppy Joes and that would make my day complete. My mom always thought they were way to messy and would hardly ever make them for us. So it always seemed like a treat when we had them. There is something comforting with this elbow on the table, big old napkin wiping sandwich. That is, if you want to call it a sandwich. It does contain a bun, but it certainly is not a hamburger although it does have hamburger in the ingredients. Sloppy Joes are in a class by themselves. They are the epitome of comfort food. Brown ground beef and onion in a large skillet. Drain all the fat. Mix ketchup, mustard and molasses. Mix into the ground beef and heat through. Serve on your favorite bun. Please join Veronica on her blog, on Facebook and on Twitter! Hi there. Found this blog on Pinterest. This particular burger recipe grabs my attention because it looks so easy to make for there are only a few ingredients required. Plus molasses and ketchup combined are such a treat for my sweet tooth. Maybe I should try this with muscovado sugar instead of molasses since it’s the only raw sugar I have right now. Regardless, it’s a great recipe. Thanks for sharing.